"Trestles is in the style of an American IPA. 2-row malt and imported light crystal malt create the nice color and clean finish. We use CTZ and Chinook hops in this beer following it up with a dry hop of Chinook and Centennial in the fermenter bringing out a citrus aroma. 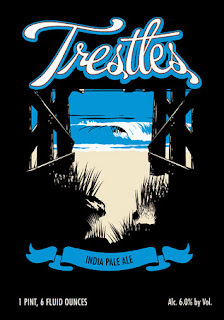 Trestles IPA is light bodied, clean and pleasantly hoppy." 6.8% abv 92 i.b.u. - Pours a rather clear straw yellow to very light copper color. Foamy fingers of white fluffy head settle quickly to a thin pillow with foamy lace about the glass. Certainly a solid looking IPA. - Wonderful grassy, citrus, and fruity hops with a wonderful pine resin aroma. A subtle and yet smooth smelling bready malt with light sweetness. Just what I like. Little bit of a grainy caramel backbone. - Bready and biscuit-like malt with just a touch of caramel and light esters with a great fruity and grassy hop. Certainly some pine and earthy hops going on, and all very well balanced without being overly big on caramel malt. - Great chewy attributes with a nice drying touch from the big bitterness. It's a medium bodied brew with almost the perfect consistency and carbonation. Certainly a winner. 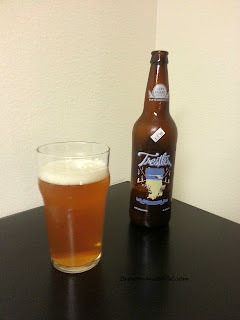 - This IPA fits my taste almost to the "T". It's not one of those big grainy caramel bombs, but yet a well balanced, bready west-coast style IPA's that I love. The bitterness is high, and has just the right aroma hops to compliment. Go get it, you will not be disappointed.